We provide domestic customers with a 1st class service. For over 35 years in the industry with a reputation built on recommendation. We specialize in boiler installations, servicing, repairs and general heating maintenance. Are you looking for a plumber Blackpool or a gas engineer plumber in Blackpool? That’s where we can help. Alan Haigh Plumbing and Heating believes that great plumbing services should be easily available to everyone. We provide domestic customers with a first class service. 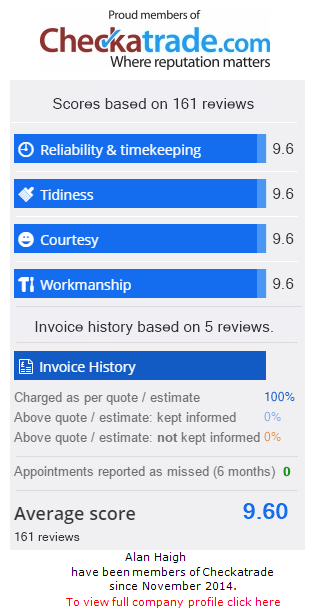 With over 35 years’ experience in the plumbing and heating trade, our reputation has been built on recommendations. We are committed to working closely with our customers to deliver a cost-effective solution that best meets your requirements. We specialise in boiler installations, servicing, repairs and general central heating maintenance. Visit our services page for more information. Based in Blackpool, we are available for all plumbing and heating jobs in Lancashire including Lancaster, Preston, Thornton-Cleveleys and Fleetwood. We are able to offer free, no-obligation quotes and expert advice. We have public liability insurance of £5 million and all of our work is guaranteed. You can find out further information about Alan Haigh Plumbing and Heating by calling 07836 612410 or send us an email by going to our contact page. From the installation of a new gas cooker, relocation of your gas meter or moving a radiator, we can take care of all domestic plumbing jobs. Get the maximum performance from your boiler with an annual boiler servicing. It is recommended that your boiler should be serviced every 12 months. Alan Haigh Plumbing and Heating started up in 2002, and we’ve been on an impressive ride ever since. In the beginning, we completed plumbing and heating installs for property developers throughout Blackpool. Over time the positive vibes spread and the firm grew, Alan Haigh Plumbing and Heating quickly became a preferred choice for letting agents, service providers, small businesses and homeowners. We’ve tried to stay true to our core beliefs – to supply an extraordinary customer experience to all who need a domestic gas engineer or commercial services. We owe big thanks to our loyal customer base for joining us on this amazing journey and we hope that many more customers will become an important part of our history. Our Blackpool gas engineers complete work to the highest specifications, and we are very proud of our high-quality workmanship. We offer a timely, reliable and individual service, and most customers come back to us, again and again, thanks to our friendly approach and flawless after sales care. Fact: Planning on replacing or installing a whole new boiler? You could save up to £300.00 per year by upgrading to an A-rated energy efficient boiler. With lots of boiler heating spares stocked at our Blackpool office, our team of expert heating engineers can conduct boiler repairs/boiler replacements with speed and efficiency. However, if this is unachievable we have close links with our manufacturers who are able to deliver stocked items within 24 hours. However, if boiler repairs aren’t possible then we can offer a boiler replacement at a competitive price. No callout fee – however, if you require our diagnostic service only then hourly rate fees will apply. To ensure the safety & efficiency of your equipment it is vital that gas appliances are serviced & inspected on a regular basis. From as little as £85 + vat including the gas safety certificate, we can offer you peace of mind. Peace of mind that you and the individuals you are responsible for will stay safe. Aside from carbon monoxide, there is always the chance that a faulty appliance could be leaking gas, which over time could be disastrous. where lives are concerned it’s always better to be safe than sorry. Also, you must remember an efficiently running appliance is far more economical to operate, so the annual boiler service will pay for its self. Why choose Alan Haigh Plumbing and Heating? At Alan Haigh Plumbing and Heating we understand that a new boiler or central heating system can be a significant investment. We can help you to make a good choice by speaking about energy efficiency, health and safety, and performance. We’re at all times happy to give free quotes ahead of undertaking any installation or upgrade work. Contact our on-call gas engineer in Blackpool today for a free quotation, or go and take a look at our Facebook page. We also accept payments by credit and debit cards.